Think back to your preschool or kindergarten classroom. Do you remember sitting each morning in a circle with friends singing a song? I bet you might be able to sing one or two of those songs to this day. Circle time activities have lasting impressions including those cute and fun circle time songs. We can even build literacy skills through song. Are your kids tired of singing the same old songs? Yes? You need this. Do you want to add more literacy learning into your circle time? Yes? You need this. Do you want your kids to be more actively engaged during circle time? Yes? You need this. Kick your circle time up a literacy notch. This is the resource for you! Circle Time Songs and Chants is perfect for anyone who does circle time with toddlers, preschoolers, or kindergarteners. It can even be adapted and used for small group or individual children. So, if you are a homeschooler, it would also work. Are you ready for an easy to use resource to transform your circle time? Here is What You Get? Save time with these ready to use 97-page ebook which includes 35 songs or chants. All the songs are original and based on familiar tunes such as The Farmer in the Dell, Do You Know the Muffin Man, and I’m a Little Teapot. Each song is ready to be printed and used during circle time with the kids. You have a new song for almost every week of the school year. Most of the songs can be used throughout the year. There are also some seasonal songs. That is almost one new song for each week of the school year. Some of the songs also have printable props. You will find these directly behind each song. There is an even a resource section that includes materials you can use during your circle time activities. You will find songs to help teach the following concepts and skills. Each song is on a separate page making it easy for you to print what you need when you need it. Plus, can enlarge it so the whole class can see it. 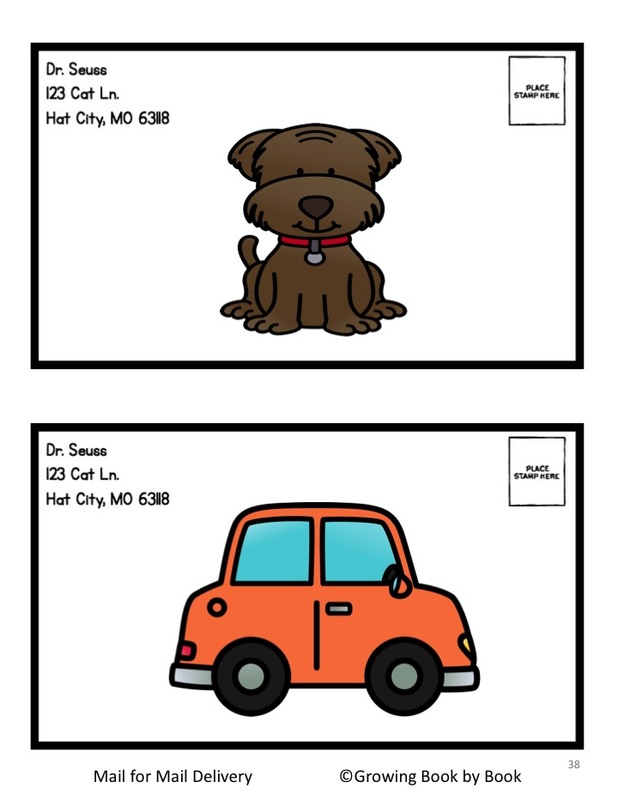 Some of the songs come with printable props to use to build literacy skills. 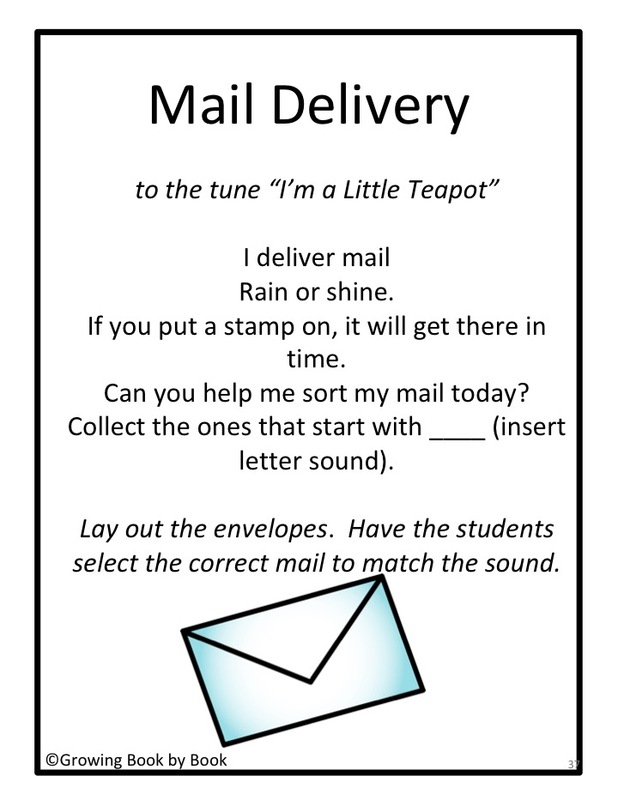 This is one of 5 printable pages for the “Mail Delivery” song. Just print, cut, and use during circle time. A few of the songs have been featured on Growing Book by Book and are available for free. All other songs and resources are exclusive to the ebook. Just click the button below to take you to the store and checkout. Please note this an ebook. After you make your purchase, you will be emailed a link to download the resource. * This is a PDF file. There are no refunds on digital products. I purchased this and printed it. I love this! However, i can’t find the downloaded file on my computer. Was this a one time download? Hi i never received my download after purchase. How to i get it please? Hi Emma, can you send me an email at jodie@growingbookbybook.com and I’ll be happy to help you. Thank you for all you do for teachers!